Historians have paid too much attention to revolutions and too little to the creation of political stability. . . . Stability, no less than revolution, may have its own kind of Terror. Of all these changes, the restriction of forest use was one of the most galling to the peasants; resources that had always been as free as the air they breathed and that remained close at hand were suddenly being denied to them. Forestry officials might be well-intentioned—though they seemed to be as concerned with forest revenue as with conservation—but their actions deprived peasants of what seemed natural rights. . . . Such restrictions constituted . . . a leading grievance in more than one Southeast Asian peasant movement. The nineteenth century was a turning point in forest management and the forms of state control over the teak and nonteak forests of Java. It was then that a bureaucratic, colonial Forest Service drew boundaries between forest and agricultural land—on maps and in the field—and established police to restrict people's access to trees and other forest products. Through a process of trial and error, regulations for profitable tree plantation management were encoded in colonial law, as were the philosophies of forest conservation for hydrological purposes. The ideology of "scientific" forestry was embraced by the colonial state and its foresters, while local institutions of forest access and property were gradually phased out of the legal discourse. 1 The ideas of this period, and the impacts of these policies on the lives of forest-dwelling people, remain significant today; the last forest laws effected by the Dutch government were drawn up in the late 1920s and continue to dictate contemporary Indonesian forestry. This period was also the beginning of the foresters' great concern with their eminent rights of domain over land, timber, and the demarcation of forest boundaries. Their possessiveness is seen today in the persistent use of the terms of exclusion that criminalize customary rights of access to forest products and land: "forest theft," "encroachment," "squatting," and "illegal grazing." Forest dwellers continued to engage in these activities, despite the pejorative labels, in their practice of everyday life. They had to resist the state's increasing resource control in order to subsist, and thus were making, in effect, a political statement. As the twentieth century wore on, peasants continued to counter-appropriate forest land and species. Their actions, and the formalization of the colonial state's self-declared rights to the forest, set the stage for the complex conflicts that continue between foresters and forest villagers today. When Governor-General Daendels arrived in Java in 1808, he organized the exploitation of Java's teak forests, passed edicts on appropriate management, and secured the government's monopoly on teak, forest labor, and shipbuilding. For the first time in the colony's history, a quasimodern government forest service, the Dienst van het Boschwezen, was created, with "rights" to control land, trees, and forest labor (Soepardi 1974a:20). 3 At the time, only teak timber was valued for its profits and shipbuilding; thus the domain of this early forest service was limited to lands where teak grew or could be grown. The declaration of all forests as the domain of the state (Landsdomein), to be managed for the benefit of the state. The assignment of forest management to a branch of the civil service created expressly for that purpose. The division of the forest into tracts (percelen) to be logged and replanted on a rotating basis. In three years, Daendels was unable to secure the apparatus of the state forest management agency. Though his ideas were written down as regulations and carried out in the field during his rule, he was not in power long enough to ensure their continuity. Key components of Daendels's plans changed during the nineteenth and twentieth centuries, namely, the structure of the Forest Service, the scale of its power, and the elimination of the blandong labor services (Schuitemaker 1950:39). Nevertheless, his attempt to implement a kind of a state forest management agency was an important step influencing the Forest Service born in the mid-nineteenth century. Daendels was determined to manage the teak forests so the colonial state could profit from them for decades to come. He required the inspector general to report any incidents of high-level corruption, slackness in duty, or breaking the oath of office, and to swear "he would never scheme with wood traders, award them wood, or steal wood himself" (Soepardi 1974a:54-55). He also established the first regulations punishing misuse of the forest as defined by the state. The testimony of a "well-known person of good name" that a Javanese or Chinese had been caught "red-handed" or "suspiciously wandering without purpose in the forest" was sufficient cause for imprisonment. The maximum penalties for forest criminals were ten years in prison or the payment of a fine of 200 rijks dollars. Two-thirds of this fine went to the state and one-third to the person who reported the crime. Appeals could be made, but punishments would be reduced only to exile or shorter prison terms (van der Chijs 1896, 15:120-21). These regulations represented a harsh change from previous circumstances, but they were difficult to enforce; no forest police were yet patrolling. Besides passing edicts concerning the technical aspects of forest management (issued August 21, 1808), Daendels appointed bosgangers, or subdistrict forest managers. The bosgangers oversaw logging, replanting, collection of teak seeds, and the girdling of trees the year before they were to be cut (Soepardi 1974a:55-56). Like the forest overseers working for the VOC, Daendels's bosgangers were mostly ex-soldiers (Brascamp 1917:207). Daendels eliminated all private forest exploitation, and monopolized the trade and transport of teak timber for the state. This meant that all leases of villages and the forests they were to cut for private entrepreneurs were voided as well (Boomgaard 1987:23). In Rembang Residency, forest laborers, their village lands, and the adjacent forest lands were placed under direct administration of a Board of Forests (Furnivall 1944:65). Each woodcutter was given one catty (approximately 1.5 kilogram) of hulled rice a day and a small annual allowance of iron, salt, and gunpowder (Raffles 1817, I:183). The laborers worked eight to fourteen days in the forest at a stretch, during the work season (February to November), and were allowed eight to fourteen days' rest after each period of work (Boomgaard 1987:23). Daendels's successor during the five-year interlude of English control in Java, Lieutenant-Governor Stamford Raffles, was determined to save money, and dealt a crushing blow to many of Daendels's state forest management measures. He felt that the state was overinvolved in forest management and that the system was expensive and unnecessary. Raffles retracted almost all of the forestry organizational reforms implemented by Daendels. Only in Rembang was a special forest superintendent appointed; in other residencies, the task of forest administration and oversight fell to the residents (Raffles 1817, I:184). Raffles believed that the Dutch had sponsored the cutting of an excessive quantity of poor teak timber, below the quality required by contemporary shipbuilding standards. Believing that Indian teak was of much higher quality, he reasoned that making Javanese teak competitive within the trading sphere of the British empire would be too costly. Raffles felt the government monopoly on teak sale and shipbuilding created demands on government funds to police its interests. Moreover, he observed, forest laborers were oppressed and lowering wood prices would only cause them greater hardship (Raffles 1817, I:183). Raffles initiated a policy of reserving the largest and best forests for the state and allowing private entrepreneurs to lease and log the rest (ibid.). Raffles also parceled out forest land as "gifts" to Javanese elites. In 1813, for example, he gave "Raden Adipatty Singasarie Penathan Djoeda ... and his heirs forever ... a tract of forestland situated in the District of Brebes \[in then Residency Tegal\] as a free gift.... This land was then \[to be\] entirely free from cultivation and habitation" (Zwart 1934:547). In his History of Java, Raffles was vague about his own conservation measures, but estimated that 40,000 or 50,000 beams could be extracted each year without damage. He was also more lenient in prosecuting forest "crimes." Not only did he want to save money, but he had also relinquished the government's absolute monopoly on teak. Philosophically, this was a major departure from previous state and VOC forest policies. A treaty signed the next year reestablished British access to timber and labor, while indicating that the sultan retained his rights to the land, or at least his rights to rule a particular territory and its inhabitants. "H H secures to the British Government the sole right and property of the teak timber within the whole of the country subject to His administrations" (ibid., 698, emphasis added). Later, Dutch writers of the first set of scientific forestry laws and other colonial legal documents interpreted the control of the Javanese ruler over land or territory as being equivalent to Western property rights, which connote ownership. This interpretation did not allow for the more complex aspects of access to land and land-based resources operating in Java's forests at the time. Local people, regional rulers, and entrepreneurs were engaged in a "layered" system of rights to control or use the forest and its products. This system was flexible and adapted to different needs and different circumstances. When the Dutch reassumed control of Java in 1816 they adopted some of Raffles's more profitable ideas, but also reestablished the Forest Board of Daendels's time. In 1826 the commissioners-general abolished the Forest Board and transferred control over the forests and forest laborers to individual residents, thus decentralizing control over the forests (Boomgaard 1987:26). Whatever efforts these residents made to regulate forest cutting, however, conflicting objectives from other government sectors accelerated the process. During the Java War (1825-30), for example, the state cut many teak beams and logs in Central Java to build forts and bridges and to block roads (Soepardi 1974a:58-59). In 1832, under the Cultivation System, 5 the forests were brought under the jurisdiction of the Director of Cultures, though the residents retained effective administrative control over the forests in their own districts (Cordes 1881:212). Teak forests were cut heavily with little regard for logging regulations. The tallest, straightest trees were selected to build sugar factories, coffee warehouses, tobacco-drying sheds, and housing compounds. An extensive road system was built through sections of the teak forest complex to deliver the prized logs to sawmills and woodworking centers (Schuitemaker 1950:40). Luxurious teak homes were constructed for plantation managers and highly placed personnel. In addition, roasting coffee, drying tobacco, and industrial processing of sugar cane from the extensive government plantations required tremendous quantities of fuel. In two regencies of Semarang Residency, 60,000 logs were cut just to build tobacco-drying sheds, while in Pekalongan Residency 24,000 cubic feet of firewood were cut annually for sugar refining. By regulations effective between 1830 and 1836, local people were required to cut and haul wood to the factories. After that year, factories were assigned their own forests from which they were permitted to cut their fuel. Apparently, the factories did very little reforestation. Later, when these enterprises were no longer subsidized by wood deliveries, they split the thick walls of the old sheds to build more sheds or to sell (Cordes 1881:208-10; Departemen Kehutanan 1986, I:67). Between 1837 and 1840 an average of 16,300 blandongs were employed annually by the state; until 1843 their average annual teak cut was approximately 100,000 logs. Twenty years later this average annual cut had nearly doubled to 175,000 logs (Boomgaard 1987:27), and unauthorized teak cutting, as always, continued. Private shipbuilders, who were legally required to purchase wood from the government, obtained teak from Chinese, Arab, and European middlemen with personal connections in forest villages (Zwart 1930:974). The other drain on forest resources imposed by the nineteenth-century colonial government was the construction of roads and railroads (Kerbert 1919:626, 627, 647-50; Boomgaard 1987:28). Daendels started the construction of a cross-Java post road in 1808. Railroad construction began in the 1860s, and by 1880 nearly 1,500 kilometers of track had been laid for state railroads and steam trains. West and East Java were connected by continuous rail tracks in 1894, when the line linking Batavia, Bandung, Yogyakarta, Surakarta, and Surabaya was completed (Shiraishi 1989:8). Forests were cut both to construct and to make way for roads and railroads. Teak trees were cut to size for the construction of sleepers, and fuelwood was needed for the steam trains. Railroad sleepers were also exported; some 280,000 sleepers were exported from Java in 1882 alone (Kerbert 1919:625). Eventually, the State Railway (SS) was given its own forest concession to supply itself with teak. The construction of railways also facilitated the extraction and transport of teak from the forests ever more distant from the coast. The first forest railroad was built in North Kradenan in 1901 and 1902. By the end of 1912 the Forest Service's own railroads had 600 kilometers of track, and by 1916 about 1,000 kilometers of track (Kerbert 1919:627). In 1909 and 1910 construction of monorails was also begun to transport teak from the forest interior (Departemen Kehutanan 1986, I:149). In sum, though the foundations of state forest management were being established in the late nineteenth and early twentieth centuries, the power of other government sectors and the progression of colonial extraction were such that the forests' major enemy was the state itself. Technological developments and applications greatly influenced both the power that the Forest Service was gaining in the early twentieth century and the shape of the forest resource from which it was extracting more and more timber. In other colonial economies, such as India, the pattern was one of a triangular conflict between the state's interests in protecting and producing from the forest, industrial wood demand, and forest users' subsistence and cash needs (Guha 1990). In the case of Java, the points of the triangle were similar but different components of the state often opposed each other. Moreover, many of the wood-consuming industries were state enterprises or directly served the interests of the state or of individual colonial officers. The 1865 forestry laws 6 are credited with being the first forestry laws for Java. Along with the Domeinverklaring of 1870, which declared all unclaimed and forest lands as the domain of the state, these laws laid the basis for "scientific forestry" as it is practiced today. Although the philosophical principles of state forest management had been nurtured for some hundred years or more in the Indies, and elsewhere for millennia (see, for example, Fernow 1911:13-16), there was a difference between the new scientific regulations and the preceding years of declarations and treaties. Land control superseded species and labor control as the key to the state's forest policy. The state did not give up these old forms of control, but as times and the nature of the colonial state changed, so did the modes of forest control. To recap the events leading up to the creation of the first scientific forest laws: In the half-century after control of Java was restored to the Dutch in 1816, a flurry of regulations regarding forest management had been made and retracted (Schuitemaker 1950:39-41; Soepardi 1974a:49-61). Individuals' usufruct and ownership rights to teak were defined more clearly under the Dutch colonial state. For example, Daendels issued directives 7 stating that teak trees growing on private property or on the private estates (tanah partikelir) could be cut for the owner's own use without government permission. But if the teak were transported off the property or sold, a 10 percent tax was due the government (Soepardi 1974a:56). This was similar to the 10 percent tax paid the sultans by the VOC and other renters of forests and forest villages. Subsistence and commercial uses of teak were thus differentiated in policy, with the location of the teak (on private or state lands) creating further divisions in the policy. Teak transport was taxed because it was assumed to be for commercial purposes. The nature of the Javanese kings' claims on the forest, however, had not simultaneously invalidated local systems of forest use. Such a notion of concurrent rights in forest products and land differed greatly from the systems of absolute domain imposed subsequently by the Dutch. To the Javanese rulers, land had been important insofar as it bore profitable or useful fruits (food, wood) and was worked by subject populations. Territorial control depended more on the balance of power between the king and regional rulers (Moertono 1981:111-14). But as the Company annexed territory, territorial control became more important, and state-imposed controls on forest lands left little or no room for layering local, regional, and statewide systems of claims to forest resources. Two other aspects of the new colonial state's forest regulations concerned forest villagers. One was the nature of changes in labor requirements, and is treated in the following section on labor. The other concerned the government's limiting villagers' access to the forest to cut wood for household or other uses and discouraging cattle grazing in young stands. The policies on villagers' rights to cut wood were particularly ambiguous. These latter restrictions were irregularly imposed and easily misinterpreted. In all forests from Cirebon Residency eastward that were not designated for large-scale exploitation, forest villagers and woodcutters were allowed to cut some wood for their own use, but were restricted to logs less than twenty feet long and six "thumbs" wide. Cutting wood for rivercraft, carts, and the needs of regional government was allowed. The cutting of wood for charcoal or teak timber that the government might harvest in the future (an unpredictable variable) was also forbidden. Forest villagers could use waste wood, stumps, roots, and underbrush. If they used wood for restricted purposes, it was to be confiscated and the offender punished (Brascamp 1924b:917-18). The following sample of these paper regulations illustrates the ambiguity of policies governing people's access to wood. In 1822 Staatsblad no. 43 permitted forest villagers to cut fuelwood and timber for house construction or agricultural tools (Cordes 1881:204); this was retracted in 1838 by Staatsblad no. 19. In 1842, however, Staatsblad no. 5 stated that wood could be cut from the state forests for construction of riverboats and carts (ibid., 211-12). This was augmented by Staatsblad no. 26 in 1850, which allowed forest villagers to cut wood from government forests for riverboats, oxcarts, and horsecarts. Staatsblad no. 3 in 1851 required villagers to secure permits from local government to cut wood for subsistence uses (ibid., 212). Finally, in 1865 it was decided that forest villagers could take branches, fallen wood, and the wood from forest thinnings for their own use, but in collecting these they had to be "under close supervision" and were restricted to particular forests (Staatsblad no. 96/1865) (Soepardi 1974a:61). The development of scientific forestry laws was concurrent with other changes in the nature of the colonial state and affected the structure of the Colonial Forest Service (Boschwezen). It was becoming more and more bureaucratic, the precursor to a contemporary state forest service. Based on laws, using professional foresters trained in forest science to make management decisions, drawing maps of the forest and its other holdings, and policing the forest as a means of protecting state "property," forest management in Java followed the more general pattern of bureaucratization emerging in all sectors of colonial management. The forest laws were written by a committee appointed by the governor-general in 1860. The committee consisted of an inspector of estates (plantations), a forestry inspector, and an official of the justice department (Soepardi 1974a:60; Departemen Kehutanan 1986, I:74). 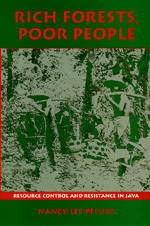 The roles of these participants were, respectively, to develop a plantation-style management system for timber crops, employing wage laborers from neighboring forest villages; to make sure trees were planted at the proper intervals and that the timing of harvesting, planting, and thinning of the timber crops was in accordance with the trees' potential yield and lifecycle; and to identify crimes (e.g., tree theft or unauthorized cutting, illegal grazing, and setting forest fires) against the states' forest-based property and set punishment for them. Thus, the Dutch planned to "order" the forests for "proper" management, to follow the principles of science in carrying out their work, and to prosecute those who thwarted their efforts at orderliness according to a set of laws of their own making. Territorially consolidated management of state forests, based on scientific principles and dependent on plantation labor, became the accepted and legal means of forest use. Except for granting local people access to wood thinned in the process of management, and to deadwood or fallen branches, the laws criminalized most traditional forest uses by forest villagers. The changes in the definitions of forest crimes are summarized in table 3.1. SOURCE: Departemen Kehutanan 1986, I:75. Theft was a particularly nebulous concept and looked different in different settings. For example, the government's wood quotas were cut and shipped to Rembang or Surabaya where officials from other departments clamored for the best cuts. Meanwhile, private firms unable to acquire wood from government sources continued to build ships or handle timber, sometimes selling to government departments, in spite of the state's monopoly. However, bureaucratic procedures were tedious and changed frequently, as did sources of wood, private entrepreneurs' agents in forest settlements, and the means of transporting the trees from the forest. Ship orders had to be filled within nine to twelve months of receipt, barely enough time to acquire timber through legitimate or clandestine sources, to cut and haul the wood, to build the ships, and to send them to the client, with no time to dry the wood sufficiently before construction (Zwart 1930:973). Village contacts, and the networks for illegally cutting and carrying wood to the buyers, were of criti&cacute;al importance to the private entrepreneur. In many instances, the government turned a blind eye to this sort of theft while arresting and prosecuting villagers taking teak for their houses. In keeping with the land classification processes being initiated throughout the colony, the 1865 forest laws labeled and began measuring the forests under specific types of cover and under different forms of management. For the first time, nonteak forests (Wildhoutbosschen, literally, "wild woods" or "junglewood forests"), particularly those above certain elevations or topping the island's string of volcanoes, were included in the category of state forest (Lugt 1933:112). Unlike the teak forests, they were placed under state management for protection, not production. Teak forests were divided into those which were under regulated management and those which were not (Lugt 1933:33). In teak forests under regulated management, private industries bid at public auctions for the rights to cut particular tracts (concessions). Between 1865 and 1874 the number of private concessions increased from seven to seventeen, and private companies were felling some 51 percent of the annual teak cut (Kerbert 1919:629; cf. Boomgaard 1987:31). Management in these forests was much more intensive than in the others, with the industry being responsible not only for cutting and transporting the timber, but also for replanting. Government foresters handled policing and maintenance of the nonregulated teak forests and the nonteak forests. Government foresters eventually supervised replanting in all forests. By directly involving state foresters in the management of only some of the forests, the state saved money. However, wood theft, fire, and grazing plagued the nonregulated teak forests and nonteak forests, incurring high costs. As a result, in 1874 all teak and nonteak forests except those in the (now greatly reduced) principalities of Surakarta and Yogyakarta were categorized as "regulated" (Cordes 1881:251). By 1875 another set of forest laws, including regulations on policing and the punishments for various forest crimes, had been put into effect (Lugt 1933:33; Schuitemaker 1950:41; Soepardi 1974a:51, 61). 11 Private industry now bid on parcels in all teak forests, not just the best ones. 12 The pace of the timber industry's involvement was slowed by the international depression of the 1880s, causing a drop in the number of concessions, the amount cut, and an 11 percent drop in the proportion of wood cut by private logging companies by 1885. By 1896, however, there were eleven times as many concessions as there had been in 1865 when the forest laws were first passed and they reportedly accounted for 93 percent of the teak harvest (Kerbert 1919:629; Boomgaard 1987:31). Nearly three-quarters of these contractors used clear-cutting methods (Koloniaal Verslag 1896:222). These methods were sanctioned by the Forest Service. The second phase of colonial forest control was well established by the end of the nineteenth century. The state was appropriating forest lands and, like the Forest Service monopoly on the species of teak, forest land appropriation by the state was justified by colonial law. The Forest Service's conservation function was used to argue for state acquisition of watershed areas. Both land and species controls were accompanied by a liturgy of colonial production objectives and conservationism. As we will see, the system of labor control also evolved through this period. The state's direct control of forest production through forced labor, the blandongdiensten, continued through the era of the Cultivation System, ending with the general trend toward "liberal" policies and the "freeing" of labor to work for wages on agricultural and timber crop plantations. New forms of labor tying began, just after the end of the blandongdiensten, with the initiation of the tumpang sari system of reforestation. When Raffles took over the administration of Java for four short but significant years, he was unsatisfied with the Dutch form of the blandongdiensten, complaining that forest laborers, exempt from head and land taxes, "contributed nothing to government revenue but their labor." He decided that forest workers should be subjected to the same land rents as all other peasants. Rather than paying land rents in cash, however, the forest workers' "wages" were to take the form of tax remissions. The transaction only took place on paper: forest labor was credited in value for taxes due on the agricultural lands worked. At the same time, private timber concerns paid the government a 10 percent tax for any timber they cut and also contracted with local villagers for forest labor—often simply by paying their land taxes (Raffles 1817, I:183; Brascamp 1922b:172). Under Raffles's version of the blandongdiensten, woodcutters and timber haulers had to work eight out of twelve months a year (April to November), 13 and were under an obligation to guard the forests during the other four months, in exchange for exemption from land rent. Whole villages were responsible for providing labor and buffaloes. According to the policy, half the "working men" of a village were supposed to be left free to work the rice fields at any time during the season. One advantage to the government of the "new" system was the willingness of the people "in emergencies...to lend their own buffaloes to assist those of the government in dragging heavy timber, which could not be removed otherwise without great expence \[sic\], while their children at other times watch and attend the cattle belonging to the government" (Raffles 1817, I:185). Raffles thus created a system for putting all the resources of the forest settlements at the immediate disposal of the government, at a cost (the value of their land rent) less than one-third the potential cost of wage laborers hired to cut and haul the wood. When the Dutch returned to Java in 1816, blandongs remained liable for land rents and continued to pay them by laboring in the forest. Villagers were still required to provide the quotas of draft animals. However, buffalo that died "in the line of duty" were supposed to be replaced by the government and loggers were provided with axes and other work tools (Hasanu 1983). All villagers also had to help build logging roads. To work off their land rents, an owner of a team of buffalo had to deliver the equivalent of fifteen giant teak trees or thirty-five smaller ones to the log yards. Small wage payments were given out in some forests. In some districts of Rembang, daily wages were 8.5 cents for blandongs, 16.5 cents for group leaders, and 21 cents for the log haulers with a pair of buffaloes (Cordes 1881:215). 14 In other forests, small salt and rice allotments 15 were paid to the workers in lieu of cash (Brascamp 1922c:1097). What percentage of these wages and rations reached the forest laborers is unknown, for it is likely that they, too, were administered through either regents, village heads, or other intermediaries assigned by the Dutch to be representatives of the forest laborers. In most locales, the state's forest production activities had to be subsidized by forest villagers' own food production. SOURCE: Adapted from Cordes 1881:216. In 1865, as part of the new forest laws and in keeping with the general trend toward liberalization (through private industry's involvement in timbering), the blandongdiensten was abolished in favor of a free labor system. The employment of free laborers had been tried as early as 1855 in the Bancar district of Tuban, with the wood being hewn in the forest and hauled through the forest for an average distance of 12 kilometers. The foresters were so pleased with the outcome that they tried the system in three more districts the following year (Cordes 1881:220-21). As colonial policy and political economy evolved, forest workers were forced to work in the forests in more indirect ways than had been the case when regents or village heads mustered able-bodied men for corvée labor. The abolition of the blandongdiensten created the need for cash to pay the workers' land rents. The land rent owed would no longer be calculated as a shadow price against the value of wages. However, as the state consolidated its forest resources, forest dwellers were increasingly restricted from converting the forest lands to agriculture and from collecting forest products. Under the new, formalized forest laws, villagers were required to purchase wood for housing—an option that few could afford. The limited quantities of timber available for private purchase were still overpriced for the poor. Nongovernment wood extraction and trade went underground. From the government's perspective, anyone taking wood from the teak forests without permission was a thief. Yet to people who made their living by converting the forest to agriculture, and who needed wood for housing and fuel, "stealing" wood was a totally foreign concept. Although forest villagers may not have realized the vastness of the state forestry organization's control, they were no doubt aware of the limits on their daily use of the once-accessible environment. The demarcation of forest boundaries with stone posts (palen) and the formation of a formal forest police force were yet to come to the whole forest, but the preliminaries—forest mapping and the recruitment of state forest officials (bosbeambten)—had begun. Punishments and fines were imposed for such forest crimes as firewood collection, charcoal manufacture, wood-cutting to build new homes, and grazing cattle in the forest (often the same animals used to haul timber). Under the pretense of liberating the forest people from oppressive systems of labor obligation, the state effectively evicted people from the source of their subsistence. This indirect labor control, enforced by the ever-growing demands of the state on peasant incomes, was at least as oppressive as the blandong system that had bound the peasants for centuries. A study of native land rights in all the residencies of Java was sponsored by the Dutch colonial state in the mid-nineteenth century and published in three volumes in 1876, 1880, and 1896. The interviews in sample villages were conducted between 1867 and 1869, that is, before the passage of the 1870 Agrarian Law that changed the nature of land ownership and tenure. For our purposes, it is useful to consider the findings of this study in terms of people's access to the forest for clearing, access to forest products, and the ways in which an individual or a household obtained and maintained control over a piece of cleared land. The following discussion on variations in rights of forest access focuses on the residencies of Tegal and Rembang because the villages discussed in chapters 6 and 7 are located in regions that were formerly part of the jurisdiction of these residencies. Though the dates of village establishment were not reported specifically in these reports, villages where interviews were conducted were reportedly established from "ancient times" to "after the Java War" (1825-1830). In Rembang Residency, villagers reported that their villages had been founded for a variety of reasons: some from overpopulation of parent villages, some established in the wilderness for religious purposes, some established by refugees from upheaval in other provinces. In Tegal, new settlements had been specifically founded by people fleeing heavy labor service in other residencies or regions. Both in Tegal and Rembang, where land had been cleared for cultivation and abandoned, the clearer retained rights to that land until it had completely reverted to forest. If newcomers wished to work fallow lands not yet under forest cover, they had first to seek permission from the original clearer (Bergsma 1880:74-76, 182). In such cases, powerful local figures, who would today be called "informal leaders," 17 served as witnesses to claims of tenure rights. In some places, Bergsma reports, a village head or other authority had great control over who cleared land. In others, permission to convert forest to agriculture was needed from a local authority only if the clearer had just come from another settlement or resided elsewhere (ibid., 187-89). In Tegal, the names of the first forest clearers were remembered in many of the villages surveyed, and these individuals were considered the village founders. Here, clearing began by marking a clearance border and dividing the land among the participants according to their individual agreements with those who granted permission to clear. In some villages, the rights to the land became effective as soon as the land was divided among the clearers and each person marked a share with boundary markers. In other villages, rights would be effective after completion of the clearing; elsewhere, no rights were effective until the lands were completely planted. By the time of the survey, clearance-derived rights included the rights to sell, to pawn, and to rent the land. However, villagers in the Brebes Regency said that these capacities were not original rights, but came only as a result of interaction with Chinese, Arabs, and, of course, Europeans. Clearance rights expired after ten years, on average, if the owner left the village without designating someone to be responsible for the labor and planting obligations inherent in land access (Bergsma 1880:69-76). In Rembang, forest land was sometimes cleared by groups but the rights to that land were defined on an individual basis—that is, for particular parcels—as were the necessary permissions to clear. As long as the clearer tilled that land, he or she maintained hereditary rights to it (Bergsma 1880:189). Millions of Javanese peasants live alongside state-controlled forest lands in one of the world's most densely populated agricultural regions. Because their legal access and customary rights to the forest have been severely limited, these peasants have been pushed toward illegal use of forest resources. Rich Forests, Poor People untangles the complex of peasant and state politics that has developed in Java over three centuries. Drawing on historical materials and intensive field research, including two contemporary case studies, Peluso presents the story of the forest and its people. Without major changes in forest policy, Peluso contends, the situation is portentous. Economic, social, and political costs to the government will increase. Development efforts will by stymied and forest destruction will continue. Mindful that a dramatic shift is unlikely, Peluso suggests how tension between foresters and villagers can be alleviated while giving peasants a greater stake in local forest management. Nancy Lee Peluso is Associate Professor in the Department of Environmental Science, Policy, and Management at the University of California, Berkeley.